Vintage is a Tumblr inspired Joomla 2.5 Template that features multiple colour schemes a simple tagging system for your content and an elegantly designed Responsive design. This Joomla 2.5 Template is aimed at those users that want a simple blog style template to showcase their ideas, thoughts and inspiration. This template is packed full of features including 50 module positions, 5 background variations, eight Colour highlights and eight different tag Colour schemes. The tags are automatically populated in the k2 Joomla template and you can also use them across module classes on the page. There are ten different tag module classes available. 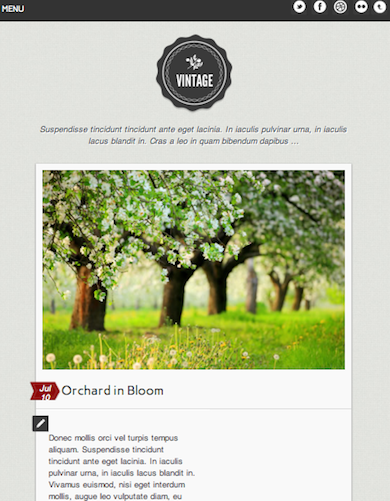 Click here to see more features of Joomla 2.5 Template Vintage. Responsive design scales to fit your browser or mobile device. JoomlaBamboo is a premium Joomla 2.5 Template and Extensions solutions provider. They have extensive support structure with a contact us page, Ticketing system, support forum, online documentation, knowledge base and more. JoomlaBamboo Joomla 2.5 Templates are clean and professional.